Dr. David Grubbs lived a true servant’s life. Born into a family of Church of God pastors, Grubbs grew in the Lord from a young age. His parents, J. D. and Inez, served churches in much of the southeast as well as Indiana. There, Grubbs attended Anderson College—known today as Anderson University—and graduated in 1960. Fourteen years later, he was awarded an honorary doctorate by the institution. As an ordained Church of God minister of more than fifty years, Grubbs served congregations in Tennessee, Ohio, and California. 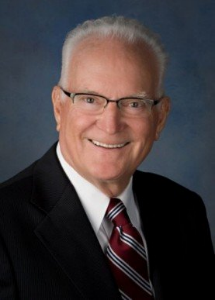 In 1990, he founded David Grubbs and Associates, a consulting and fundraising firm specializing in raising major gifts for churches, schools, universities, and civic organizations, as well as assisting in philanthropic endeavors. Because of Grubbs, hundreds of millions of dollars were raised for his clients. His son, Rev. Marty Grubbs, senior pastor of Crossings Community Church in Oklahoma City, said his father had a deep friendship with Dr. James Earl Massey. That’s a decorated legacy that his family is keeping alive with the establishment of the Dr. David Grubbs Church Leadership Scholarship. Designed for the School of Wesleyan Studies within the Dr. J. E. Massey Center for Ministry and Leadership, the scholarship is designed to meet some of the school’s monthly subscription costs. The scholarship can be applied toward tuition or fees associated with The School of Wesleyan Studies for an individual pastor or be used to enroll a church in the congregational subscription. To apply for the Dr. David Grubbs Church Leadership Scholarship, please visit wesleyanschool.macu.edu. This entry was posted in All Church of God, Central, Colleges & Universities and tagged church leadership, David Grubbs, MACU, Mid-America Christian University, Oklahoma City, scholarship. Bookmark the permalink.